Some programs may need to include libraries in the C18 project. Please consult complete set of libraries and functions available here. 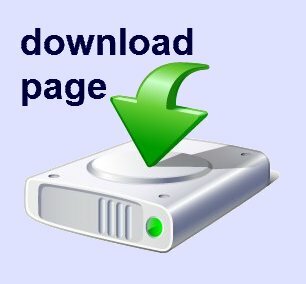 Download C18-Bolt-Template-and-Libraries-in-one-single-file.zip! This is your template to write new C18 programs with Bolt 18F2550! C18-BOLT-LEDS-ROTATE.c Shifting in LEDS from RB0...RB7. C18-BOLT-MICROSWITCHES-LEDS.c Test program for Bolt v.Lite. If SW1=OFF, makes a shifting in leds RB0..RB7 and activates and desactivates relay each second. C18-BOLT-MICROSWITCHES-LEDS-2.c Activates LEDS RB0...RB3 depending on value of microswitches SW1...SW4. Relay is ON and OFF each second. C18-BOLT-MICROSWITCHES-LEDS-3.c Second test program: activates with different patterns LEDS depending on value of microswitches SW1...SW4. C18-BOLT-MICROSWITCHES-LEDS-3.hex ***This program is preloaded in all Bolt v.Lite systems for sale. C18-BOLT-LCD-1.c Shows a fixed message of a maximum of 8 characters. C18-BOLT-LCD-2.c Shows on LCD a 16 character message with horizontal dynamic scrolling. C18-BOLT-KEYPAD-LCD.c Test program for Bolt 18F2550, connected to keypad and LCD. Uses Getbot( ) function. Reads a character from keypad and send echo to LCD. ended with 'F'. Shows result of sum in LCD. C18-BOLT-DEMO-PROGRAM-WITH-4-APPLICATIONS.hex ***This program is preloaded in all Bolt 18F2550 systems for sale. C18-BOLT-DS18B20.c Inputs the reading of DS18B20 temperature sensor using a single C18 function. Displays in LCD with 2 integers and 1 decimal. C18-BOLT-7-SEGMENT-DISPLAY-SHOWS-TEMPERATURE.c Reads temperature in celsius degrees and shows it in 7 segment display. Uses library "ONEWIRE-BOLT". C18-BOLT-DS18B20-FARENHEIT.c Display alternately for 2 seconds the value in degrees Celsius and the next 2 seconds in Fahrenheit. C18-BOLT-A-D-CONVERTER.c Analog voltage enters pin 2 of AUX header, using channel 4 (RA5 of, 18F2550, in pin 7). A decimal value (0..1023) is displayed on the LCD. C18-BOLT-SERIAL-PORT-3.c Using Hyperterminal 9600,n,8,1. Microcontroller exchanges messages with user typing in PC. C18-BOLT-SERIAL-PORT-REMOTE-CONTROL.c Using Hyperterminal 9600,n,8,1. User may control microcontroller board via a serial cable, with several commands. Serial3.c Testing the Bolt 18F2550 system with C Sharp software remote control using the serial port. BOLT-18F2550-USB-PROJECT.zip Project to test the USB Stack for 18F2550, with a VC++ software. 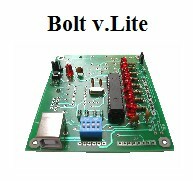 C18-BOLT-EEPROM-RD-WR.c Test program to read and write to EEPROM locations in Bolt system. The user types a 4 key password that is stored in EEPROM. C18-ELECTRONIC-LOCK-WITH-EEPROM.c Electronic lock that saves password of 4 decimal digits in EEPROM, and permits user to change it. C18-BOLT-TIMER-0-INTERRUPT.c Using interrupts of Timer 0, flashes led RB0 each second. This time base, may be used to implement a real time clock. C18-FABULOUS-FRED.zip ***new*** Game to test the participant' visual memory. Uses 3 levels of difficulty. Generates true random numbers as combinations of sequences in leds using timer 0. C18-BOLT-HANDLING-POINTERS-MPLAB-SIMULATION.c Permits to watch pointers handling in memory -step by step- using MPLAB IDE simulator. 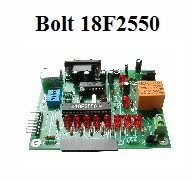 C18-BOLT-TWO-DIMENSIONAL-ARRAY-LCD.c Application program for Bolt 18F2550 system. Writes in LCD the names of 8 persons stored in a group of arrays. C18-BOLT-TWO-DIMENSIONAL-ARRAY-LCD.hex Executable file of application. C18-BOLT-7-SEGMENT-DISPLAY-SHOWS-3-DIGITS.c Displays 3 digits in seven segment display expansion module. C18-MATRIX-7X10-SHOWS-2-CHARACTERS.c Displays 2 characters in 7x10 led matrix expansion module. C18-BOLT-BLUETOOTH-MODULE.c Simple test program for Bluetooth expansion module project. C18-BOLT-PROXIMITY-2.zip Works with proximity sensor module up to a distance of 50 cms. Has three modes of operation. C18-BOLT-INFRARED-REMOTE-CONTROL-RELAY.c Command 1 activates the relay, command 2 deactivates the relay. C18-ALL-BOLT-INFRARED-REMOTE-CONTROL.zip 2 applications in a single .zip file. One is for the serial port and the second is to control the relay. C18-BOLT-SMS-FINAL-TEMPERATURE-2.c Application program for Bolt GSM project.